SOLD OUT! Join us for our winter fundraiser to benefit Sun Valley Center for the Arts! Welcome in 2018 with fellow supporters of the arts at the New Year’s Eve Bubbly Bash, which promises once again to be the valley’s most festive holiday celebration. The annual sold-out event which benefits the Sun Valley Center for the Arts is co-hosted by Sun Valley Resort and The Center’s Junior Patrons Circle. 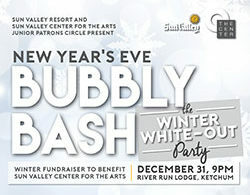 This New Year, the Bubbly Bash is a Winter White-Out theme, and guests are encouraged to wear white. Revelers will gather at Sun Valley’s iconic River Run Lodge to enjoy free champagne from 9pm to 10pm as well as a midnight toast, compliments of event sponsor Barefoot Bubbly. Attendees can snap a memory in the customized Bubby Bash photo booth and dance the night away with the evening’s music and vibe driven by DJ Lady Sinclair. Returning once again for her second Bubbly Bash, Los Angeles-based DJ Lady Sinclair and her live band have played at major clubs and celebrity events around the world, spinning mashup juxtaposing tracks that keep people hanging onto the next mix. This popular event tends to sell out quickly, so patrons are encouraged to buy tickets early! TICKETS ON SALE: Wednesday, November 1 at 10am. All attendees must be 21 and over. For more information, call 208.726.9491.